OTA students donated over 300 cans of food to Second Harvest Food Bank OC. Stanbridge College students once again raised the bar for community service by donating over 800 canned food items to the Second Harvest Food Bank in August. Overwhelming support came from Occupational Therapy Assistant cohort 3 who within a couple of days collected over 300 cans. Two of our newest cohorts, Physical Therapist Assistant cohort 1 and Vocational Nursing cohort FTW collected over 440 cans combined, adding to the success of the food drive. The week-long donation drive encouraged students and staff to provide donations of canned food in order to help the Second Harvest Food Bank and their mission to eliminate hunger in Orange County. According to the Second Harvest Food Bank, it is currently estimated that 21% of Orange County or 615,000 individuals struggle with hunger in Orange County. In partnership with over 470 member charities, the Food Bank helps feed more than 240,000 individuals each month. The August Canned Food Drive is the third food drive Stanbridge College has hosted in 2012 and is the most successful yet. In June and April, students, staff and faculty of Stanbridge College gathered together and donated over 500 lbs of canned food items. 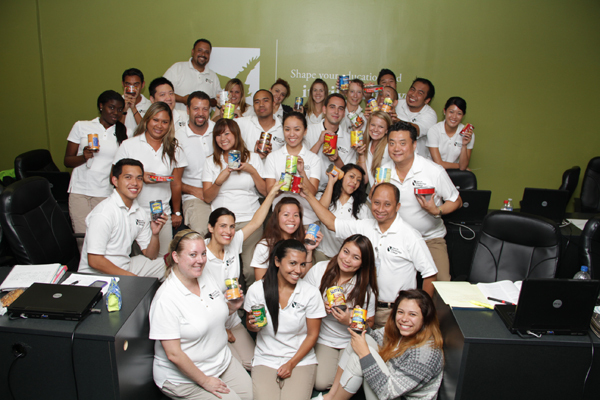 Stanbridge College thanks each one of its students and staff for their support of the August Canned Food Drive. Stanbridge College will host its next Canned Food Drive in October! To learn more about the Second Harvest Food Drive please visit http://feedoc.org. To learn more about Stanbridge College REACH community service activities and sign up for upcoming community service events please visit www.stanbridge.edu/reach.